Shirley Chan is the Chief Executive Officer for Building Opportunities with Business Inner-city Society, a non-profit agency in Vancouver which supports local business development and investment and increases job opportunities for inner-city residents. Shirley has an active interest in her community and is currently on the Board of Learning for a Sustainable Future, the Dr. Sun Yat-Sen Classical Chinese Garden and the Planning Committee for the National Retreat for Women. Craig Crawford has been involved in the development of more than 10,000 units of affordable housing and coordinating the acquisition of 45 single room occupancy hotels and other properties across the province throughout his 18-year career with BC Housing. He has also led provincial affordable housing supply programs that have helped non-profit societies provide a variety of housing, most recently, a range of supported housing options for mental health and drug addiction issues. Jill Davidson is responsible for housing policies and programs for the City of Vancouver, was the City's Homelessness Policy Coordinator and completed the City's Homeless Action Plan and Supportive Housing Strategy. She has previously prepared a housing plan for the Downtown Eastside and has been involved in affordable housing projects by identifying sites for City purchase and selecting non-profit housing sponsors. Liz Evans is the Executive Director and Founder of the PHS Community Services Society, an organization aimed at providing housing, advocacy and supports to people in Vancouver's Downtown Eastside community. The Society operates supported hotels and housing, as well as a range of programs and services including North America's first supervised injection site (Insite). Liz has been honored with numerous awards including Health Advocate of the year by the RNABC and the Queen's Golden Jubilee Award for Community Service. Catharine Hume is the Coordinator for the Mental Health Commission of Canada's At Home/Chez Soi Project in Vancouver. She is also a Director within the Grants and Community Initiatives Department of the Vancouver Foundation, focusing on youth homelessness. As Director of Policy and Research with the Canadian Mental Health Association BC Division, Catharine oversaw initiatives including a provincial homeless-outreach project. Kerry Jang is a Councillor with the City of Vancouver and works with the Mental Health Commission of Canada, where he was appointed to the Mental Health and Law Advisory Committee whose policy work will directly impact policing, corrections, housing standards and management across the city. Kerry is a Professor of Psychiatry at UBC where he conducts research onthe causes of mental illness. He has volunteered with organiza-tions focusing on homelessness, mental illness, the drug trade and their prevention. Anne Kloppenborg worked for 34 years as a Social Planner with the City of Vancouver. She had worked with a variety of non-profit organizations to support community development and community and individual capacity-building. Examples of this work include: developing policy and procedures for residential support and recovery programs for at risk youth, women experiencing domestic violence, and people with drug addictions. Anne has also worked with numerous community organizations to develop needed services and programs. Jaimie McEvoy is a long time anti-poverty activist and as a New Westminster City Councillor, has been an advocate for affordable housing and solutions to homelessness. As part of the city-sponsored Homelessness Coalition, he is promotingan affordable housing strategy. He is the Director of the Hospitality Project, which partners with churches, community groups and government to link service providers and low-income people. It hosts the New Westminster Food Bank, recovery groups, family programs and serves 3,000 people every month. has been on various committees there. Sandra is also working with the Carnegie Community Action Project on homelessnessand poverty issues and volunteers with the Downtown Eastside Women's Centre. She co-hosts Eastside Story on Co-op Radio. Mark Smith has worked in the field of mental health and addictions for over 30 years. In 1991 he became Executive Director of Triage Emergency Services, now RainCity Housing and Support Society. Under his leadership and team based approach, RainCity has grown from housing 55 people in 1993, to providing shelter and support to over 500 individuals. Mark appreciates being part of an organization that identifies gaps in service provision, implements programs that work directly with marginalized individuals, and integrates respect for their rights to self-determination. 3 days of community dialogues - in partnership with the after homelessness… theatre project - to enrich a Community Action Report for government and social service agencies. Theatre Making Policy. Speak out and be heard. This is an invitation to discuss what can be done, not what has or has not been done. 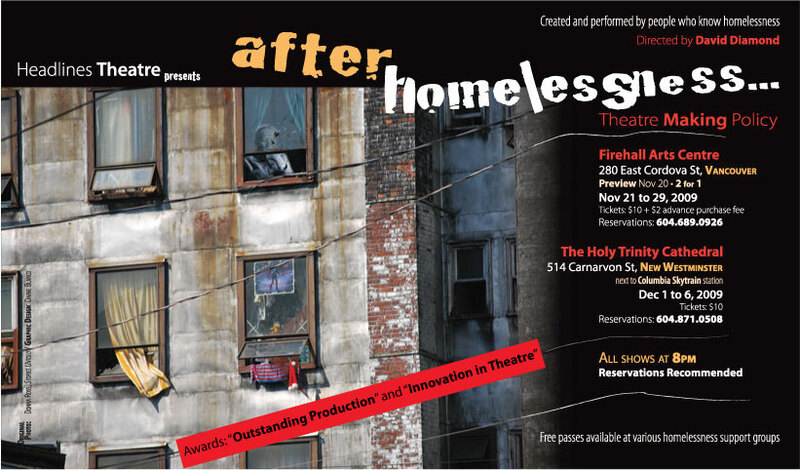 T he Community Dialogue Sessions are part of the after homelessness… project which includes performances of the interactive play at the Firehall Arts Centre in Vancouver and at the Holy Trinity Cathedral in New Westminster, as well as a photography exhibition at Gallery Gachet. The hope for these three days of panel and community discussions is to open the space for a true dialogue on these topics; to work through any blockages that stop us from moving forward on the issues in a healthy way. The sessions will focus on location, supports and services and financing, respectively. This will not be a series of lectures; the panelists are here to share their experience and knowledge with the topics, not to provide set answers. This will be a conversation between the panelists and the public, and the solutions will be sought within the conversation. Headlines has received written agreements from the Mental Health Commission of Canada, BC Housing, the City of Vancouver, the Greater Vancouver Regional Steering Committee on Homelessness, RainCity Housing and Coast Mental Health to use the after homelessness… project and the resulting Community Action Report as part of their respective research for national, provincial, regional and local strategies on mental health and homelessness. The Community Action Report will distill the suggestions from the Community Dialogues and the interactive forums at each performance of the play into policy suggestions. This legislative theatre process gives the homeless community and the general public a creative venue to use theatre to help create policy. Headlines is excited to present this series of Community Dialogue Sessions on affordable and safe housing and necessary services, and would like to thank all panelists and facilitators for presenting their perspectives on the issues. Is it viable to create shelters and/or housing in the communities in which homeless people are residing? If so, how? If not, why? Beyond bricks and mortar, what are the essential ingredients of safe, appropriate housing? How do we finance safe, appropriate housing for people who have been homeless? Kathryn Gretsinger is a journalist and journalism professor. She currently teaches at the University of British Columbia and at Langara College. For the past 20 years, Kathryn has contributed her stories, skills and research at CBC Radio. She continues to work both on air and off for the public broadcaster. Since 1981 David has directed over 380 community specific theatre projects on issues such as racism, gender roles and globalization, among others. He is the originator of Headlines' THEATRE FOR LIVING workshops, which have evolved from the Brazilian Theatre of the Oppressed. He has directed workshops throughout Canada, the USA, Europe, Namibia, New Zealand and Singapore. He has also been involved in the writing and/or directing of all of Headlines' main stage plays. Charlie Smith has worked in newspapers, magazines, radio, and television for more than 20 years. He started as a talk-show producer in private radio before becoming a news researcher at CBC television. Later, he worked as a researcher and writer at CBC radio and also did some TV news reporting. He joined the Georgia Straight as news editor in 1994, and became editor in 2005. He also taught college-level journalism for seven years. He has written many stories over the years about housing and homelessness.